OK You Precision Sheet Metal Mechanics here is a tool you can use! 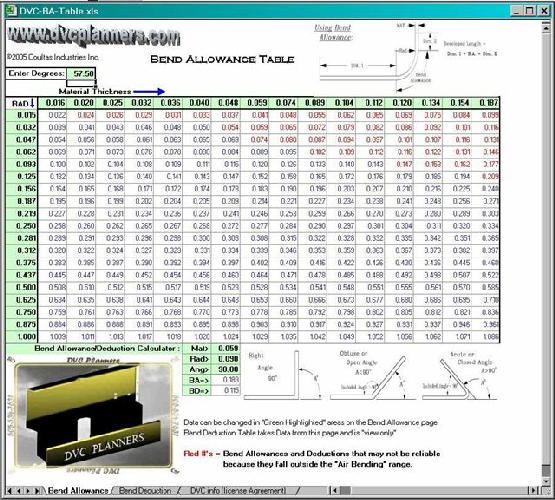 The Bend Allowance Table will calculate angles up to 360° and Material Thicknesses up to .800" and an inside bend radii up to 630.00"
The Angle, Radius and Material Columns can be changed to whatever you want and the whole table is updated to relect the new values! Spreadsheet includes illustrations of how to use Bend Deductions or Allowances. Print out your own tables for use on the floor! You are purchasing a license to use the software. Software will be sent via your email. SCREEN SHOT Of The Bend Allowance Sheet!